This BOOK SALE for a CAUSE is for you. Buy any of these used/ new books and bring smiles, hopes, joy, inspirations and love to the children of PGH this coming May 12, 2012. 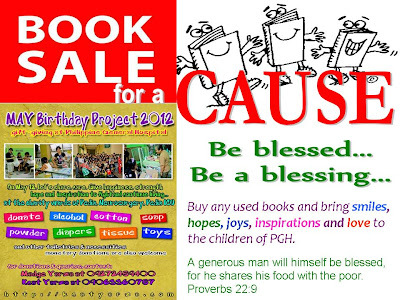 This book sale will benefit the May Project 2012, a gift giving that is more than a gift giving for the children who are confined in the Philippine General Hospital. Select the title of the book of your choice and inform me. Kindly email me on gentilient@yahoo.com or put the remarks on the comment box, this book sale is only for those who are living in Doha, Qatar.You can also call me at 5500 3586. Own a book of your choice for less and for a good cause! *all books that will not be sold will be included again on future book sale for a cause to fund other charitable projects/ activities.